This is the ninth post in a series that will eventually comprise an activity-based, unit pioneering program curriculum. Trestles are often used to support bridge walkways. IX A. 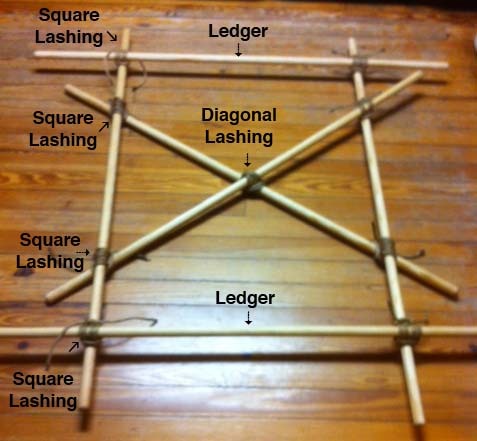 The diagonal lashing gets its name because the wraps form a diagonal where they cross the spars. It’s primary use is to spring together two spars that are not touching when the ends are lashed in place on a structure (as in a trestle). IX B. The trestle is a basic component of many pioneering projects. When we speak of a trestle, we’re referring to what has been dubbed an H-trestle. The way it’s designed yields a very strong supporting structure that is often used as a subassembly for something larger, and frequently serves to support the walkways of a bridge. 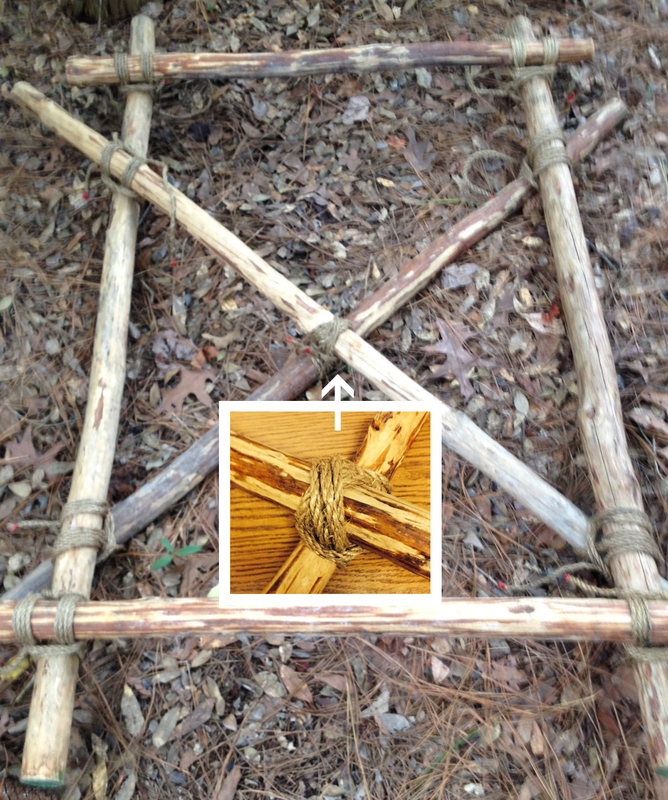 Each Scout will tie a diagonal lashing to effectively spring together the X-brace of a trestle. Working individually or in small groups, Scouts will properly construct a trestle. Using the 6-foot spars and the 15-foot lashing rope, Instructor demonstrates a diagonal lashing, then using a 10-foot lashing rope and two Scout Staves, with the aid of an instructor and following the basic four steps, Scouts will tie a diagonal lashing. 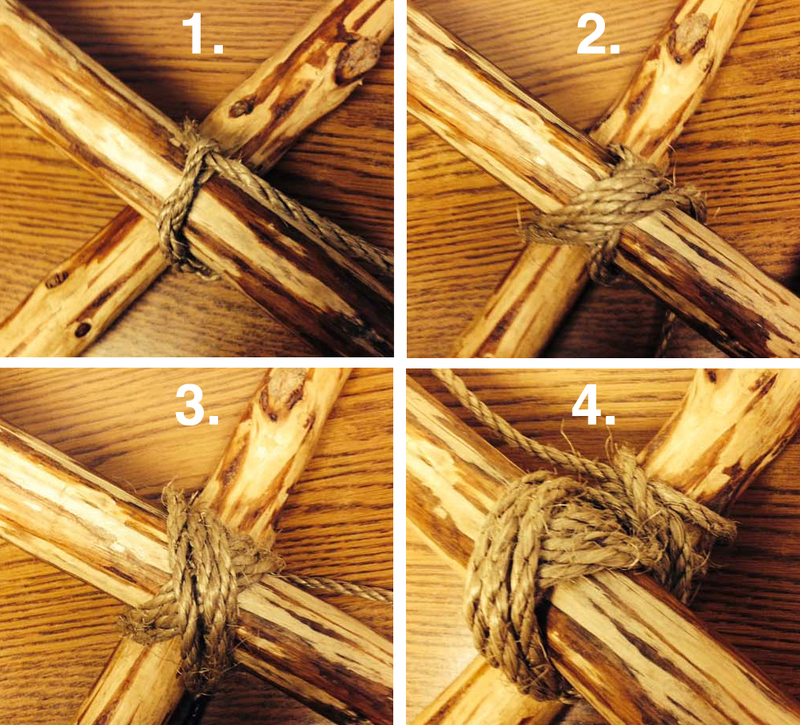 Make three wrapping turns on the opposite diagonal to the timber hitch. Keep the wraps parallel to one another and pull them tight. Make three more tight wraps across the first three, again keeping them parallel. Take two frapping turns between the poles, tightly around both sets of wraps and complete the lashing with a clove hitch around one of the poles. Lay out two poles parallel to one another as the trestle legs. Place a pole over the legs at the top and bottom to serve as the ledgers, and then lash them to the legs with four tight Square Lashings using the 6-foot lashing ropes. Turn the legs and ledgers over and place one pole diagonally over two of the legs as one of the X-braces. Where it intersects, join this pole to the legs with two tight square lashings. Place the last pole diagonally OVER one leg and UNDER the other leg, as the other X-brace. Stand the structure up. There should be a gap between the the two X-braces where they cross in the middle. Using the 10-foot lashing rope, spring the X-braces together with a tight diagonal lashing. The completed trestle should be sturdy enough to be lifted and shaken without losing its shape or becoming loose. After building their trestles, Scouts are ready to have a Roman Chariot Race.